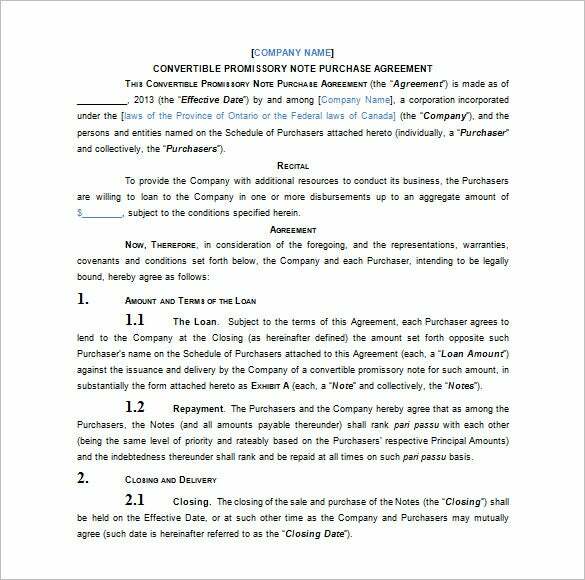 A promissory note template word doc is usually followed to format a legal agreement between a lender and debtor. It’s an important financial instrument that guarantees a promise on part of the debtor that he would pay a certain amount to his lender within a specific deadline. It’s usually a detailed document that starts with the name of the borrower, lender, the principal amount lent, followed by the promise of payment with interest, the deadline & further terms & conditions. 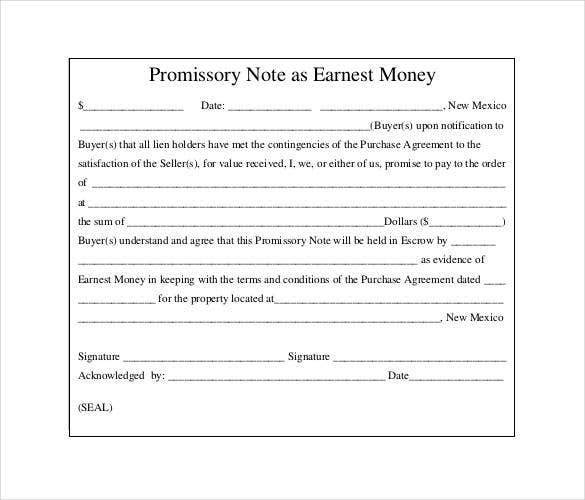 A promissory note is an important financial document that states the guarantee of payment of a certain sum by borrower to lender. 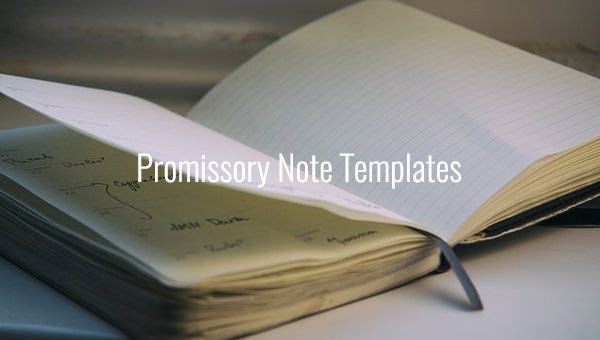 If you are about to lend some money to somebody and you don’t know how to format a right promissory note, opt for free promissory note template sample. Drafting a promissory note is an elaborate affair. 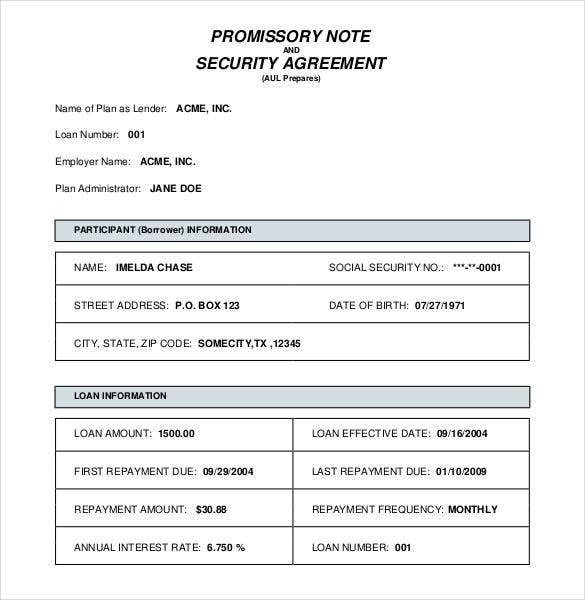 If you don’t have clear ideas on how to format a one, go for a promissory note template word example. 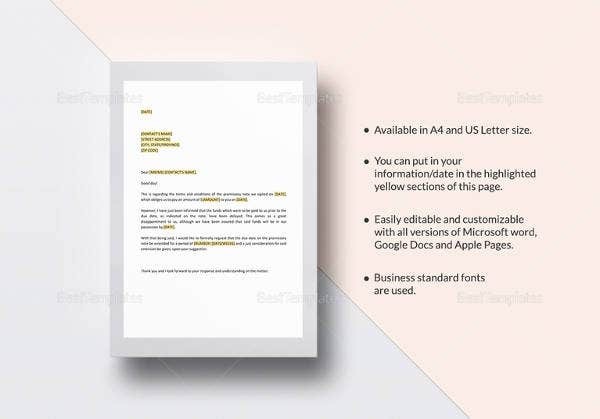 These templates come up with a standard readymade structure of an appropriate promissory note with blank space and customizable texts so that you can modify it easily. 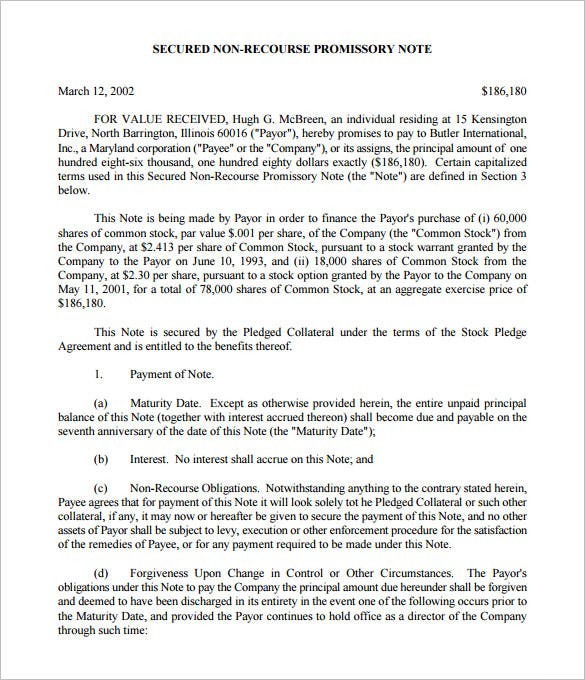 A convertible promissory note template word doc is often used by startup companies for seed investors when the former is trying to raise seed capital. The promissory note here includes a conversion quotient that states that the debt taken would convert into equity in near future through the mechanism of qualified financing. 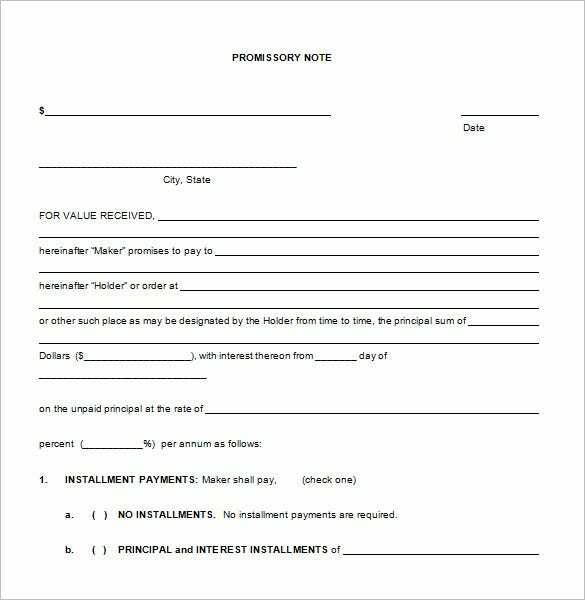 If you are asked to offer loans to any family member or friends or to anybody, you should take to a loan promissory note template sample. The loan promissory note clearly states a signed promise from the borrower to lender that he would pay the loan borrowed with agreed amount of interest to you within a fixed deadline. 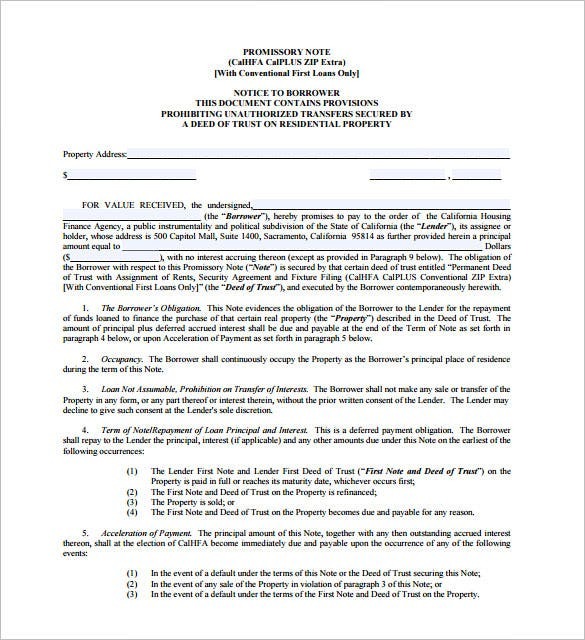 A real estate promissory note template word doc centers around a mortgage loan and the promise that the borrower would pay the needed mortgage sum to the mortgage lender within a specified time limit. In case, the borrower fails to repay the amount, the lender has this right to sue the borrower. A promissory note with collateral is a form of secured promissory note which promises that the lender can have the collateral defined by the borrower in case the latter fails to pay on time. 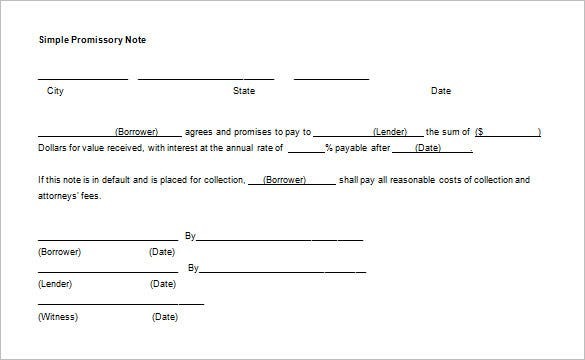 If you want ideas on drafting a proper collateral promissory note, go for a promissory note with collateral template example. 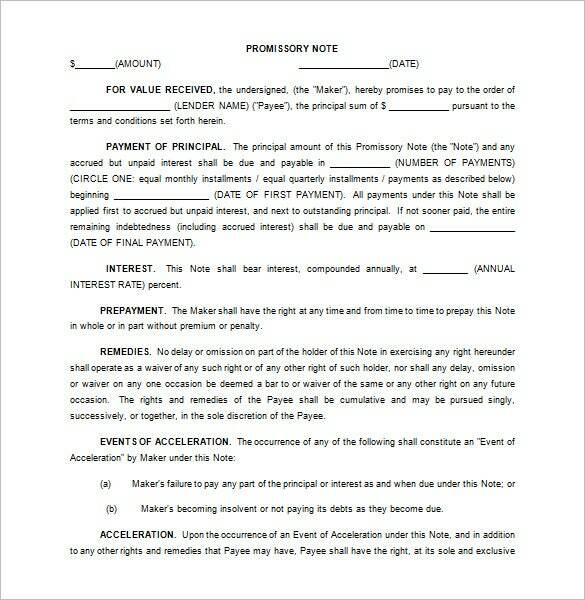 A simple promissory note template word sample is a form of financial agreement between a borrower and lender that offers an assurance from the former- that he would repay the sum lent along with agreed interest rate to the lender within a set timeline. These are usually unsecured financial instruments. Save yourself from the effort of having to make a promissory note from scratch. 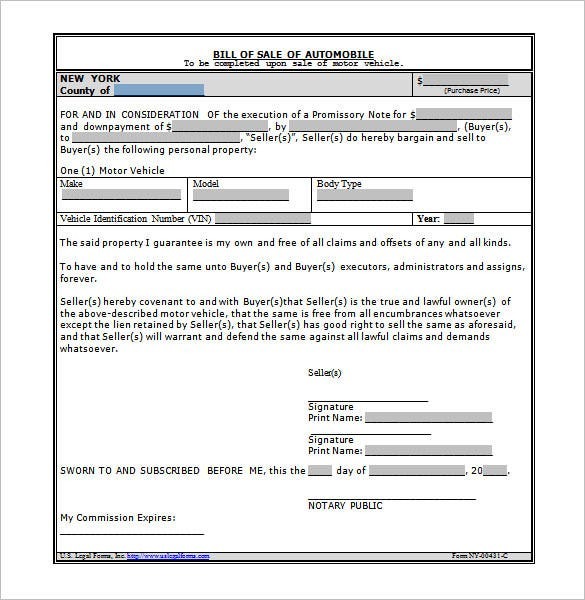 If you’re not aware of its format and layout, this MS Word format promissory note is a good example to work with. All the required standard clauses are pre-mentioned. 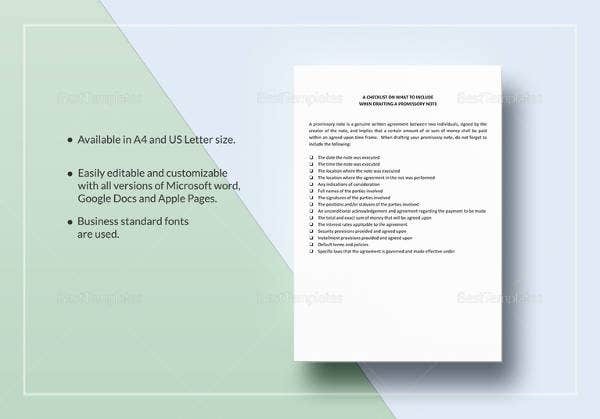 You just need to download, customize the template with relevant information in the spaces given, take a print out, and you’re good! 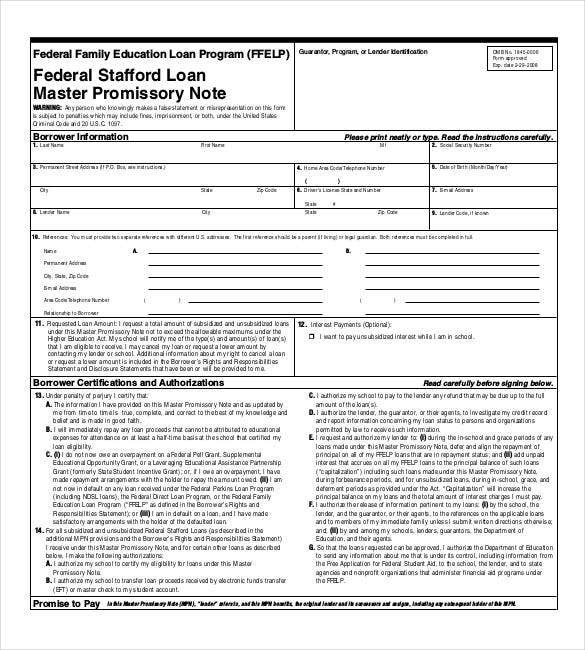 A personal loan promissory note template word doc would help you to secure a loan offer you extend to a family member or friend. 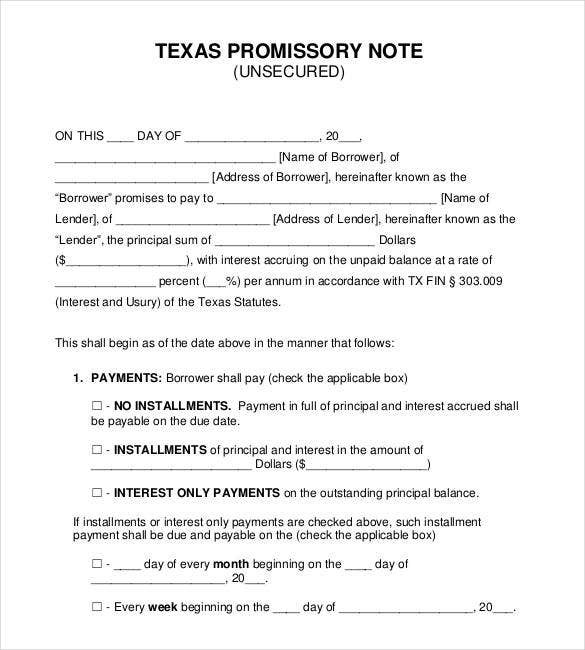 You may or may not include interest amount in the promissory note. 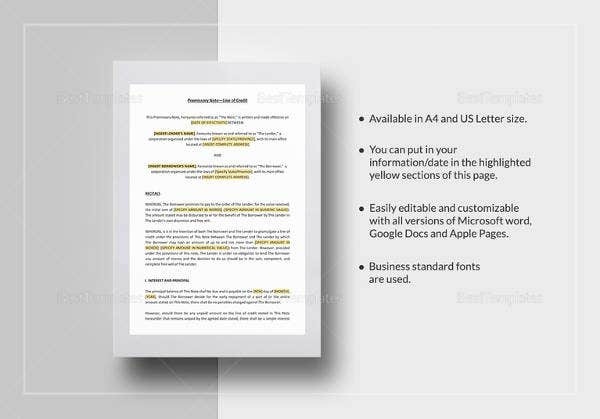 The good thing is that you will get the word doc download free of charge. 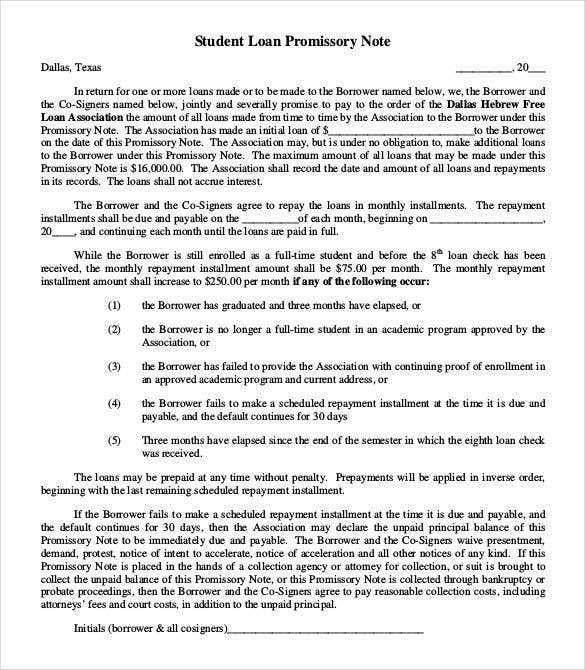 As per the Texas laws, a promissory note template Texas sample clearly states a promise from the borrower that he would pay the agreed sum with as set interest to the lender with an agreed deadline. 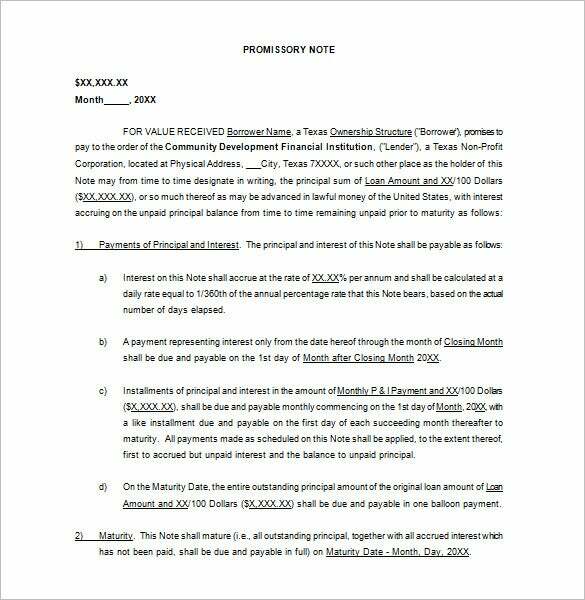 The Texas promissory note does not allow non-inclusion of repay date. It can be used for personal loan transactions, mortgages or car financing. 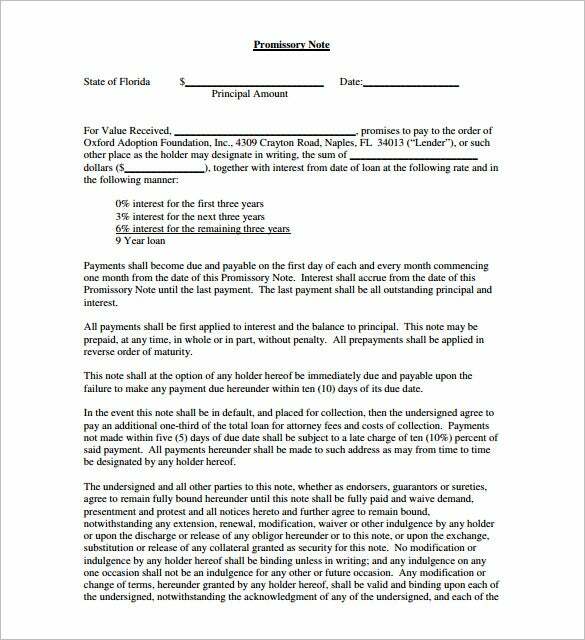 A promissory note template Florida example would be handy when you don’t know how to structure a promissory note as per the Florida laws. Added to the guarantee of repayment by borrower within a set date, the note would also include terms of default. Moreover, Florida law has made it mandatory to obtain doc stamp taxes on these notes. 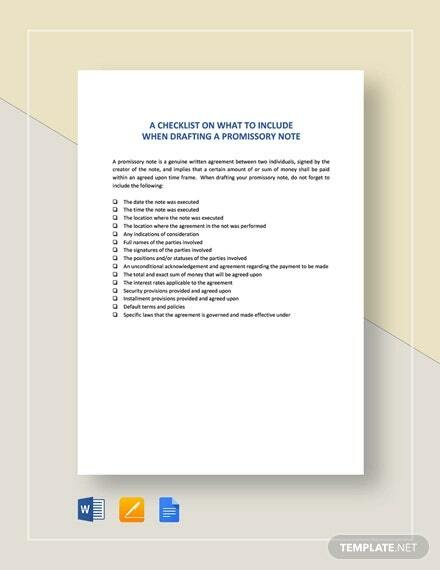 A secured promissory note template free word doc comes with a collateral clause. The borrower can suggest any of his valuable assets like car or house as the collateral. The note guarantees that the lender has this right to take over the suggested collateral if the borrower fails to repay on stipulated time. 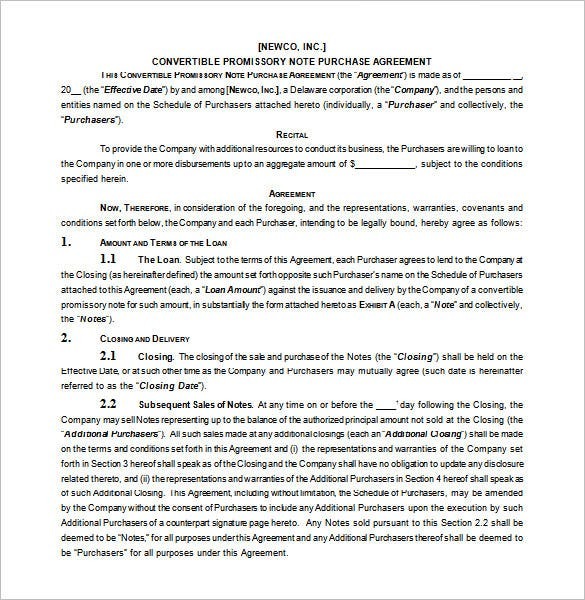 A vehicle promissory note template sample would be useful for car financing deals. If a person needs the loan to buy a car, he would have to sign a promissory note guarantying timely repayment of the agreed car financing amount with interest within the decided time. The note may or may not contain a collateral clause. 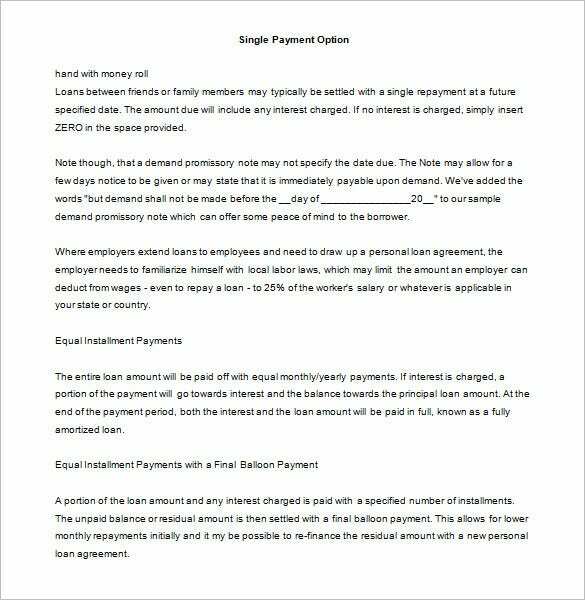 A California promissory note template example will help you to come up with a flawless legal California promissory note as per the typical laws and regulations followed in California State. According the California law on loans, the maximum rate of interest on personal loans for household and family purposes must not exceed 10 percent a year. 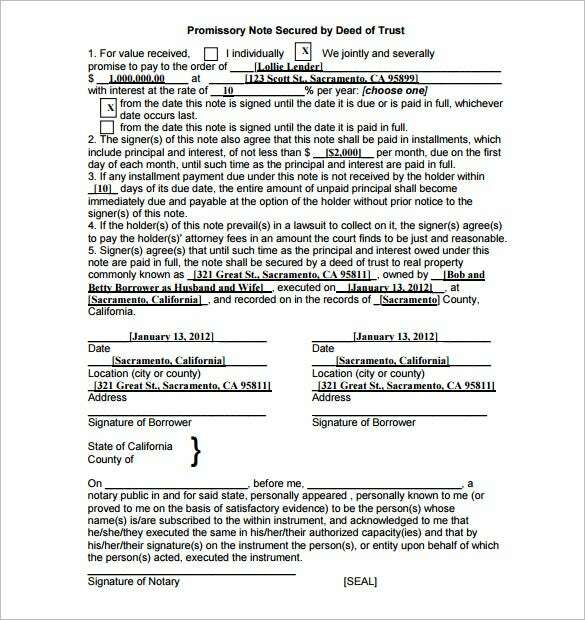 A promissory note template Colorado word doc clearly specifies names of lender & borrower. The document would also state the loan amount, interest rate & repayment time frame. 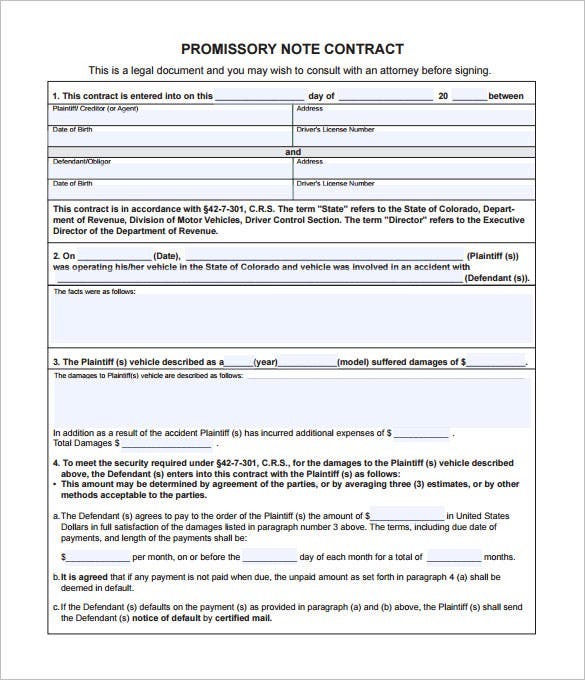 As per Colorado laws, the interest rate on promissory notes should not exceed 45% a year and if no rate is stated, the interest would be 8% annually. 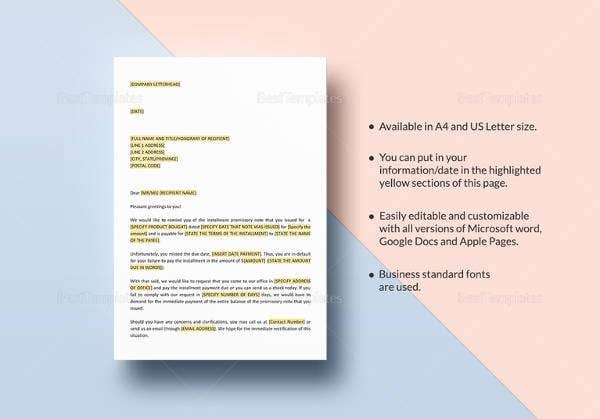 A business promissory note template sample is mostly used by startup companies in need of capital funding from seed investors. However, major corporations too take to the promissory notes in case they require substantial funding for some important project. The templates come up with pre-structured promissory note frameworks which are easily customizable. How to Write a Promissory Note for a Personal Loan? 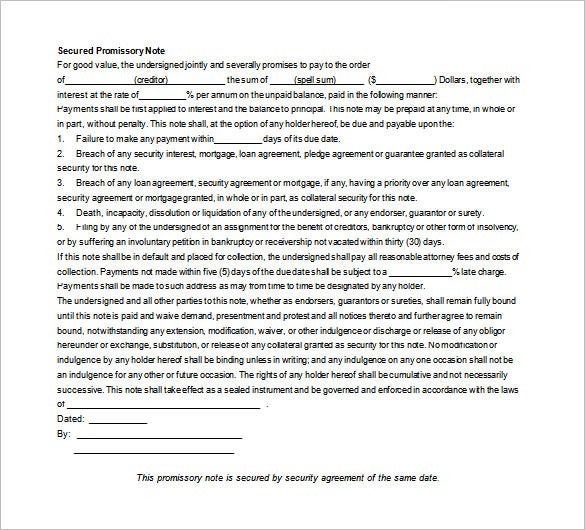 There are different types of a promissory note which are written as a loan agreement and even bank and companies use promissory notes. 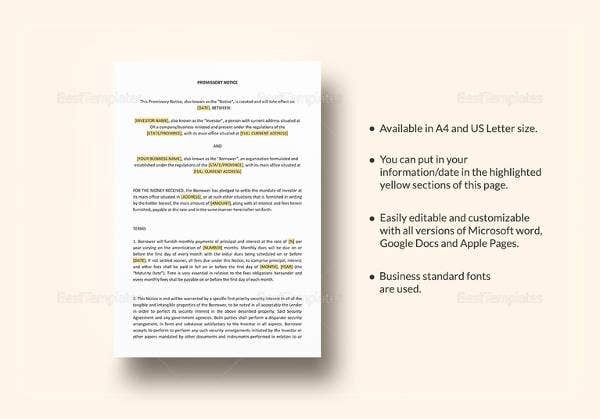 Convertible Promissory Note and promissory proforma notes are also quite common but the structure of the note promissory note changes when you are applying for a personal note. There are certain things that should be included in a promissory note for a personal loan and they are the amount of loan, repayment dates, interest rate, and the total amount of interest has been included. 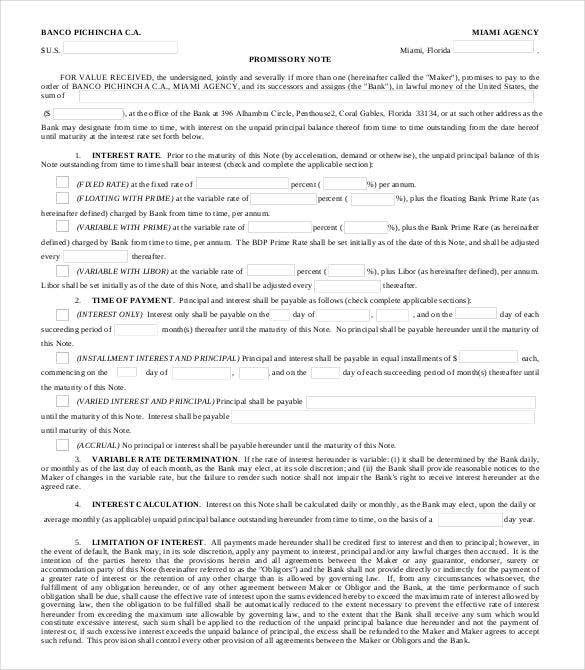 The information of collateral should also be included and in addition to this, there should be information about terms for later payment or missed payment, default terms and at end of the note, there should be a signature. 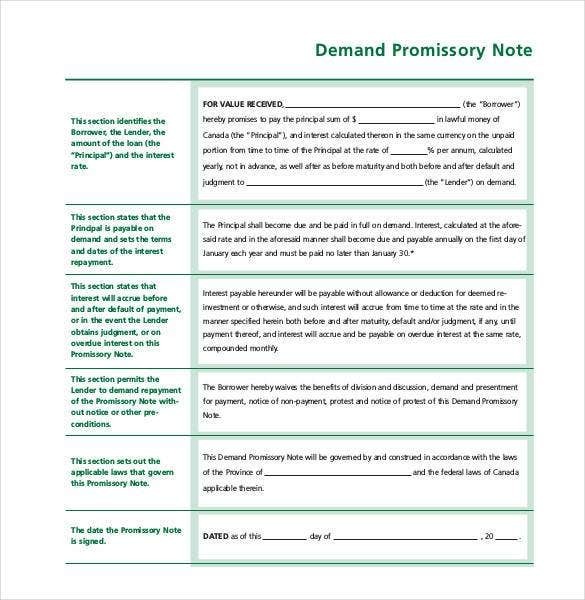 Explain the Types of Promissory Notes? 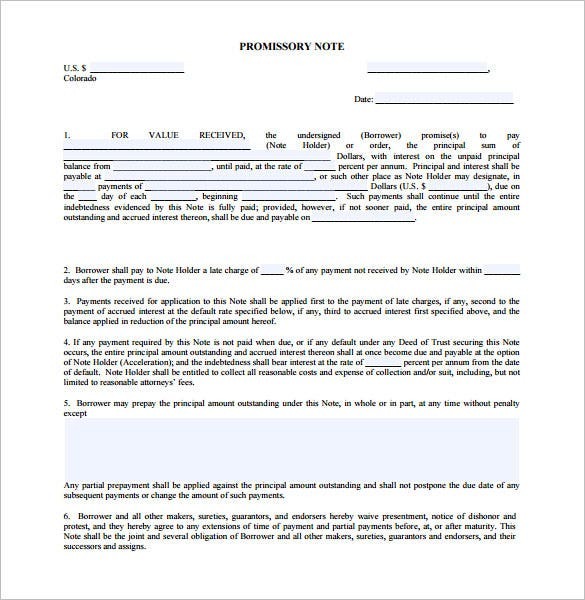 Personal Promissory Notes – These are issued while taking or giving a loan to friend and family. In addition to this, it is believed that these notes are obtained in good faith. Commercial Promissory Notes – These types of notes are issued when commercial bank provide any sort of loan. Investment Promissory Note – These notes might be issued by a business to get capital for business. 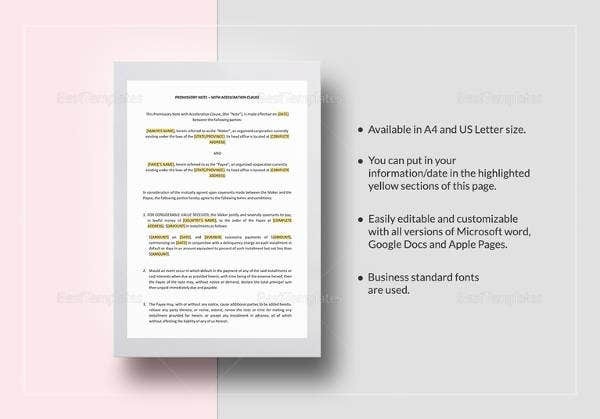 There are several templates available for the same and you may also go through International Promissory Note Templates to get more information on same. 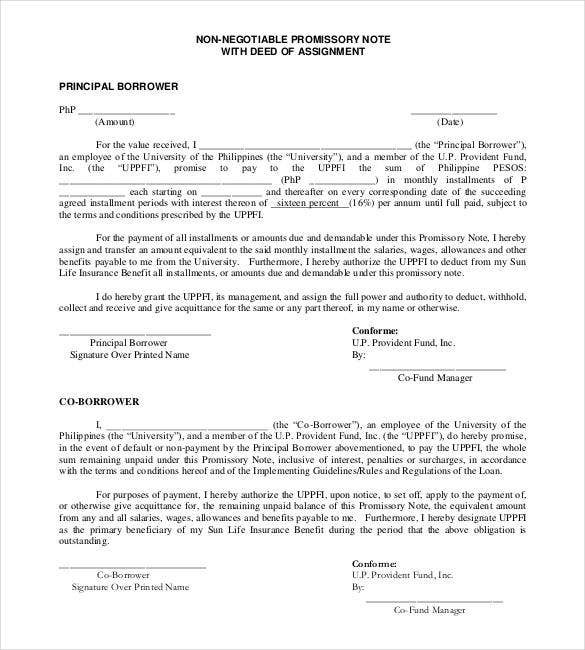 How to Make a Promissory Note for School? There are cases when parents are unable to pay the fee to the school and that might often result in the kid getting debarred from the final examination. 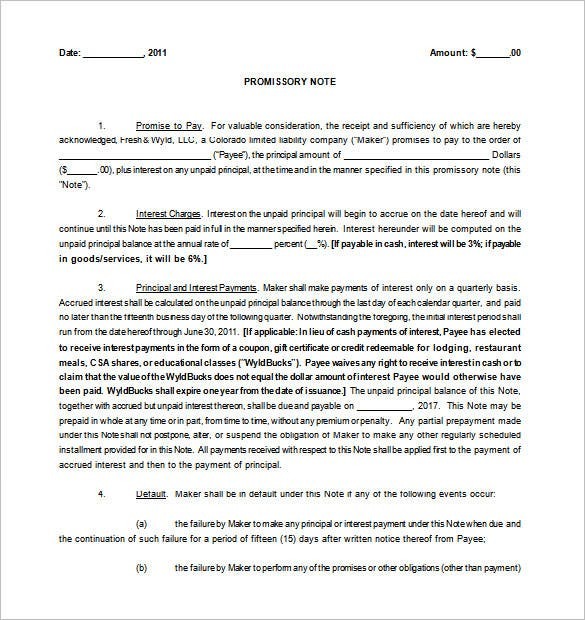 In such a case, a school may demand a promissory note to let the child appear in the exams and the format of this promissory note is similar to a General promissory Note . 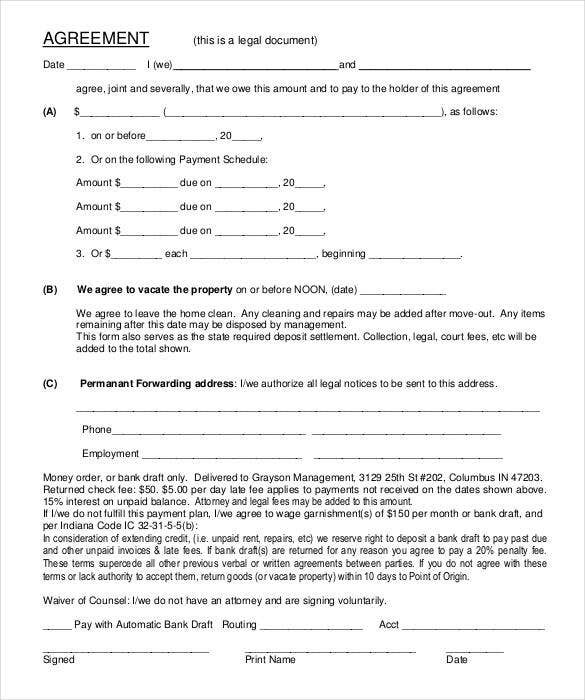 To start with, you need to mention the address of the school and the date of the promissory note. 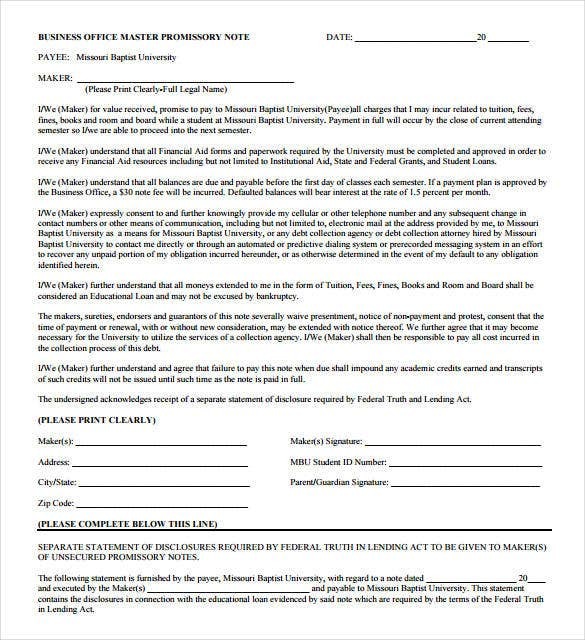 This should then be followed by the details of the student and his course details, in addition to this, you need to mention the date of payment of fee and sign the promissory note. These are used while obtaining a personal loan from a friend or a family and thus it also acts as a legal proof of the sum that is borrowed. These notes are also used by the banks while giving a loan to the people or the companies. 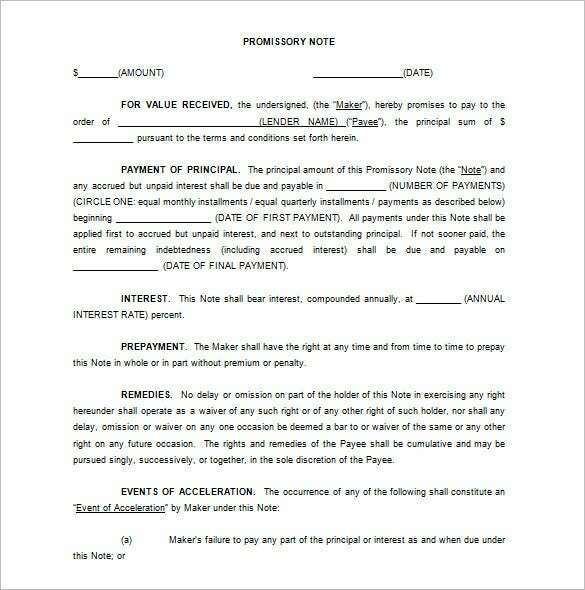 In addition to this, these promissory notes also mentioned the details mandatory for a loan agreement. Then there are Mortgage Promissory Notes which are used while buying a property on a loan. This provides the collateral to the lender and the collateral, in this case, is usually the house itself. Promissory notes are widely used and even the bank note you carry is a type of promissory note. These notes had been really popular in the 1800s as well and Promissory Note Texas were widely issued to the public by Congress even in that era. The bank may ask for a promissory note while giving a loan to you.